The Carson Top Shop changed the scene in the 1940’s with their Padded Top design. 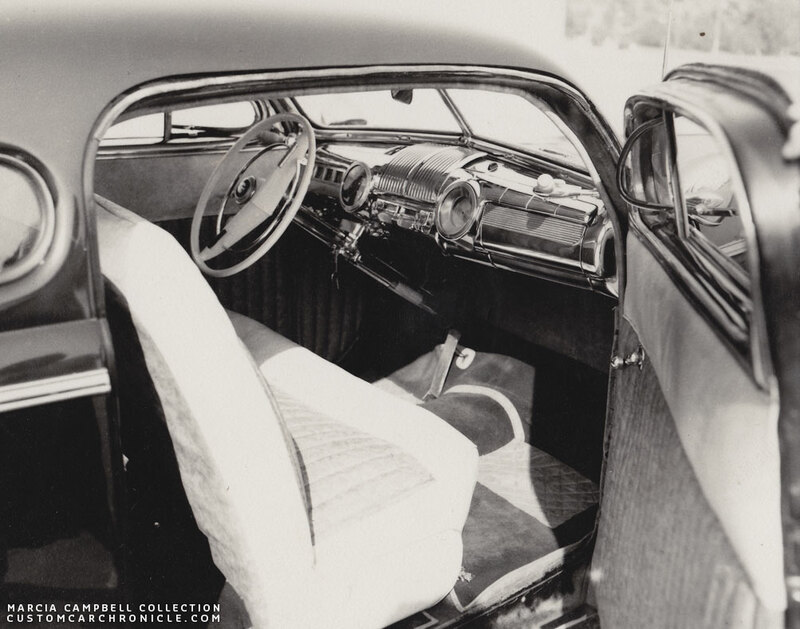 Towards the 1950’s and up they excelled in state of the art full custom interiors. In PART ONE of the Carson Top Shop story we concentrated mainly on the importance of the Carson Top Shop and their creation of the Padded top’s. How they had influenced the looks of the Custom Car scene in Southern California, and later in the rest of the US. In part two we will concentrate on the other activity that was very important at the Carson Top Shop, creating custom made interiors. 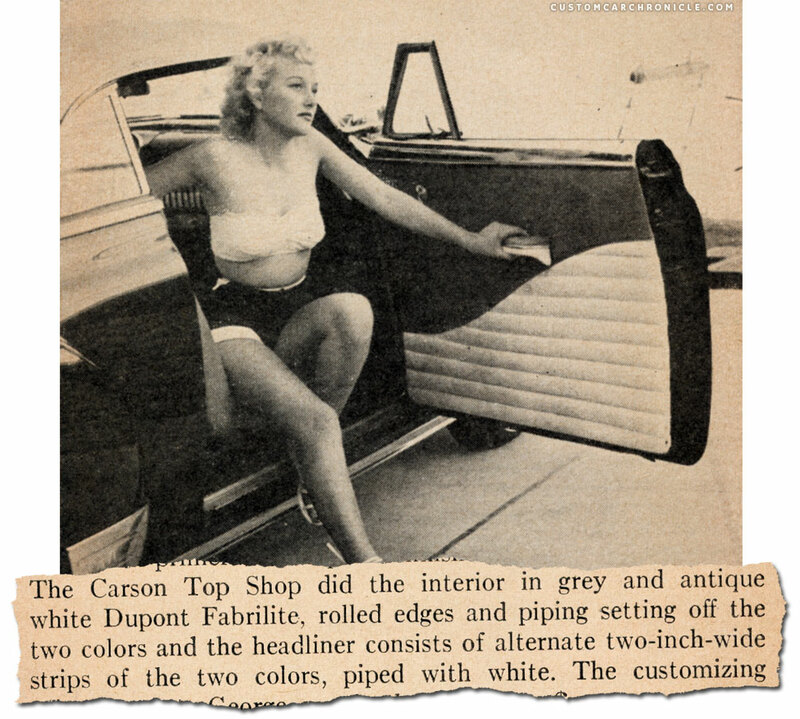 In fact creating custom interiors together with creating replacement soft tops was the main business for the shop until they developed the padded top, which became so popular in the 1940’s. 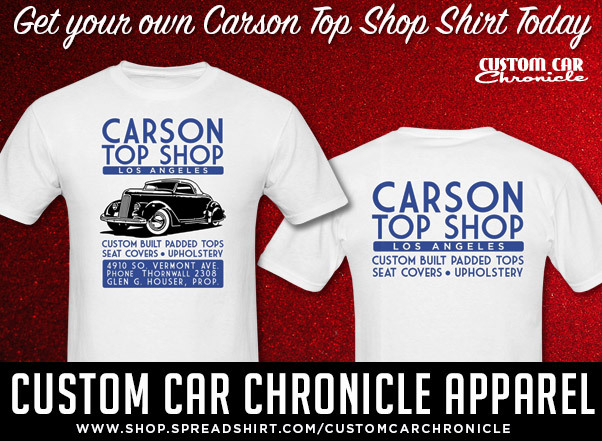 After the popularity of the Carson Padded tops had slowed down a bit towards the end of the 1940’s and early 1950’s the shop started to spend some more time promoting the padded tops and other items for the very popular, at the time, Sports Cars. 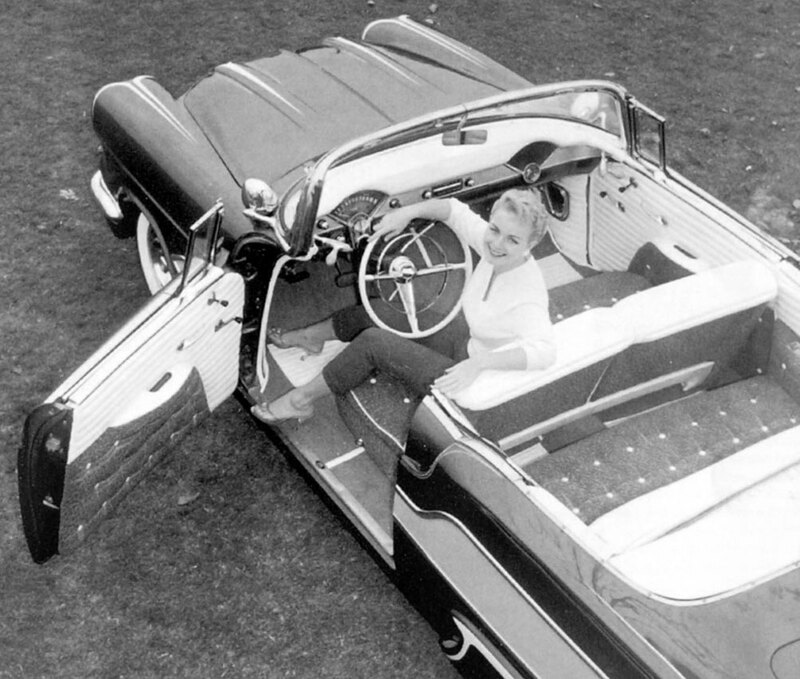 The demand for the padded top slowly declined in the early 1950’s and towards the mid 1950’s fewer and fewer where done. The main focus for the shop from then on became interiors once again. Some of the top Custom Car builders, including Barris liked to send their cars to the Carson Top Shop. They did really great work, enhancing the looks of the Custom Cars, and from what we have heard they always delivered on time. Especially the last thing was often important since a lot of the Custom Cars were finished to debut at a specific car show, and the interior was usually one of the last things that needed to be done on the cars. The Carson Top Shop did the upholstery on Marcia Campbell’s Barris Kustoms built 1942 Ford in 1950. Off white and tan were used and the carpets are a darker shade. The panels and seat centers are done in tuck&roll style and the separate feet panels have a diamond pattern, which was very popular for the lower sections and kick panels then. Around 6 years later the same ’42 Ford coupe still had the same door panels, but it looks like the carpets have been replaced by some new units. 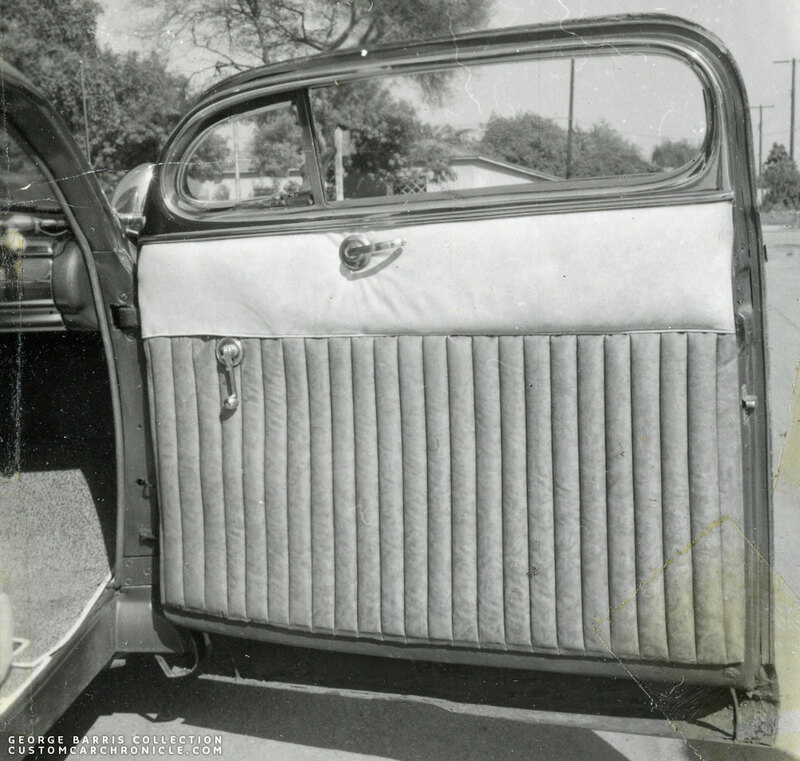 This photo gives us a good look at how early 1950’s tuck&roll panels looked like, nice and round. Notice that an interior door handles has been added to the car in the meantime. Perhaps Marcia already installed those after having been trapped inside when the batteries had died, and there was no way to open the doors manually. Beautiful wide rolls in the Barris Kustoms created Larry Ernst 1951 Chevy. Besides leading the market in doing chopped padded tops for Customs and Hot Rods, Carson also did a lot of tops for Sports Cars. They offered padded tops for MG’s and Jaguars as standard items and could of course make a top for any Sports Custom at their shop. 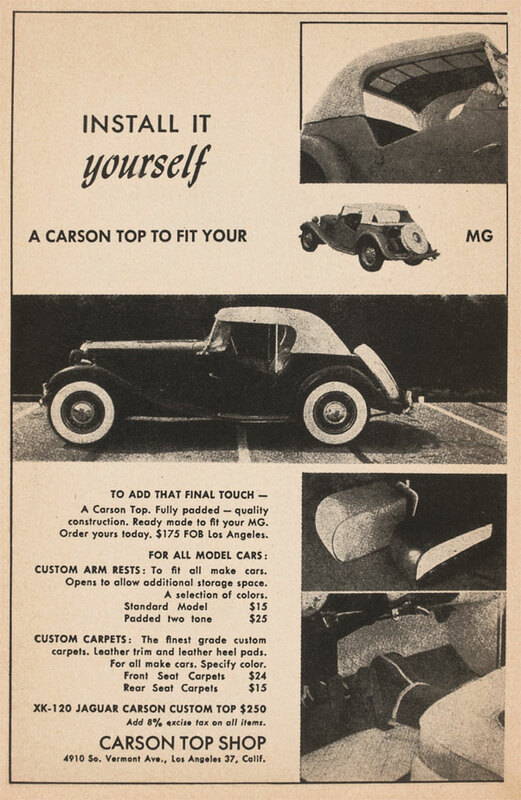 This Carson Top Shop ad also advertised the Custom Arm Rests and Custom carpets, mail order products. 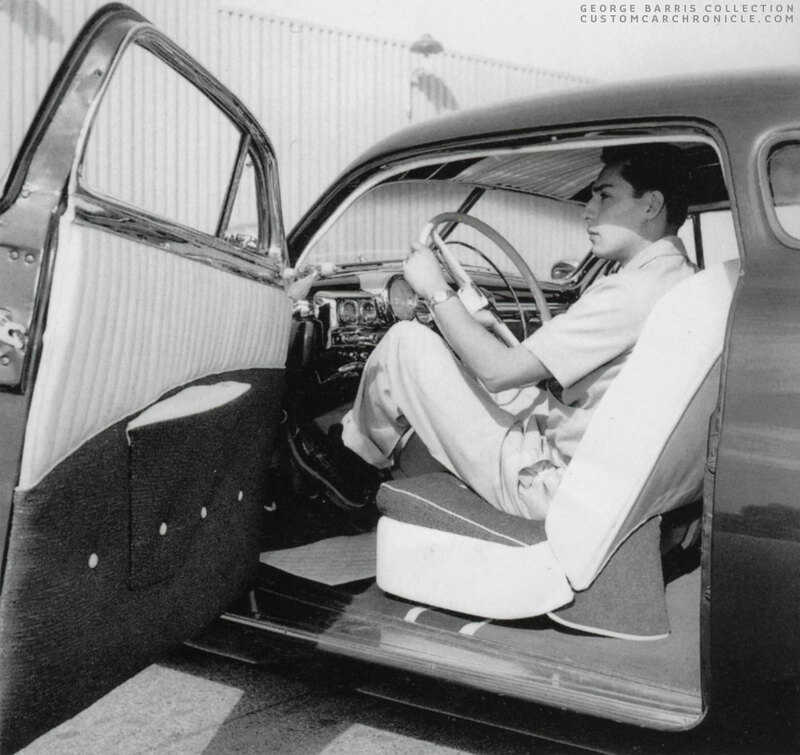 One of the very few original Carson Top Shop upholstered interiors that is still around and well documented is the interior the shop created for Bob Hirohata’s ’51 Mercury. 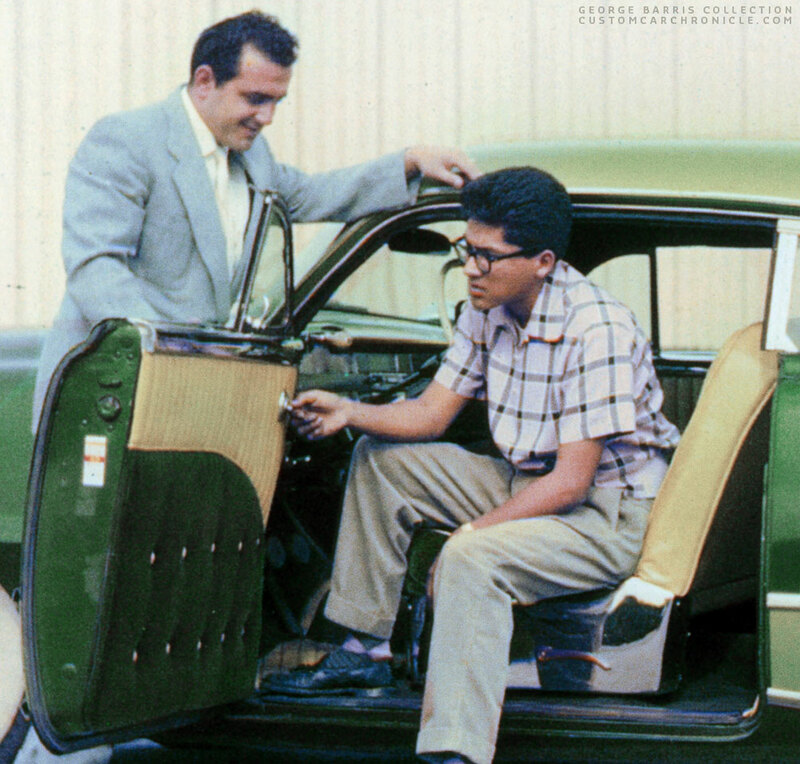 When Jim McNiel bought the Hirohata Mercury in 1959-’60, the original interior was still in the car. It was worn already and after Jim had the car on the road for some time and from years of storage the interior was beyond repair when Jim started his restoration in the 1990’s. It most likely could have been restored and saved, but the white sections of the interior had yellowed so much over the years it just looked so much out of place with the new paint and fresh chrome. 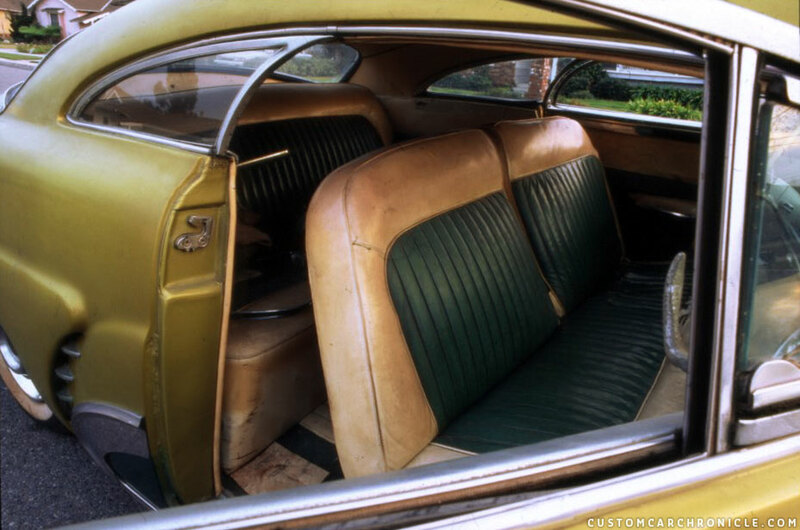 Instead Eddie Martinez, who was also doing this type interior in the 1950’s was asked to replicate it. But not the headliner. 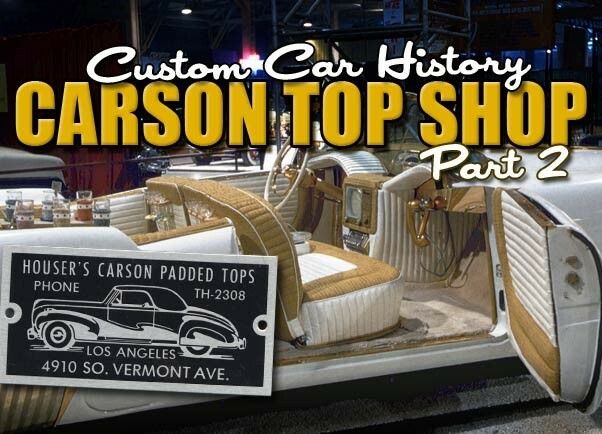 The original Carson Top Shop created headliner had always stayed out of direct sunlight and was still in very good shape. So that is the one original Carson piece that remains in the car after the restoration. There is also some material in the truck which is still original, but according the stories the trunk was mostly upholstered by Bill Gaylord. When the Hirohata Merc was nearly finished it was a rush to get the car ready to debut at the Petersen Motorama show in 1952. Carson would not be able to get the complete interior done, so Bill Gaylord was asked to do the trunk. We are making upholstery and seat covers for the man who wants the best, and who wants something original. The upholstery design of the Hirohata Mercury was rather traditional, especially compared with the wild exterior design. Three colors, dark green, a lighter grayish green and off white were the colors that were used. The one thing that really stood out, but was something that had been done before, were the length wise tuck&roll sections in the headliner. Those really made the car look big on the inside. And this is also something we have seen being used a lot after the Hirohata Merc had been published. 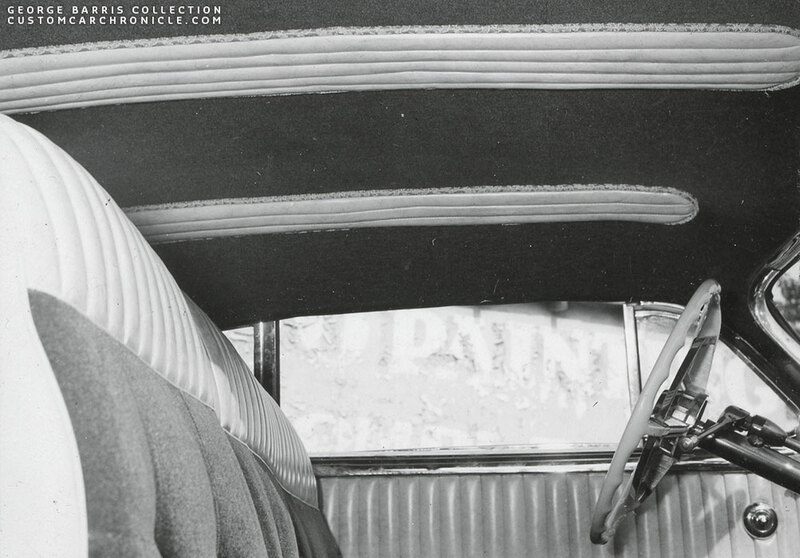 1952 photos of the Hirohata Mercury showing the wonderful three tone Carson Top Shop interior. The kick panels under the dash were done by Bill Gaylord, since a deadline needed to be made for the cars debut at the Petersen Motorama. 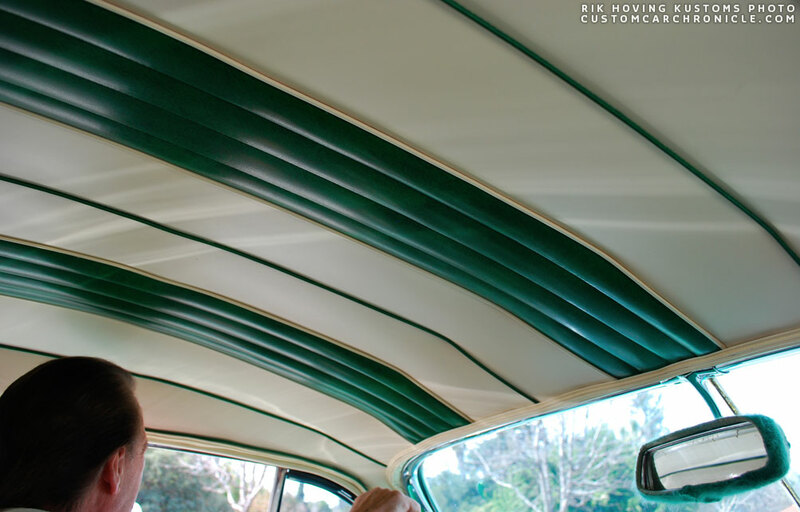 The length-wise running pleats on the headliner make the car look much longer inside. A very clever design element. Sadly the seats and side panels were in the bad shape to be restored. Eddie Martinez redid most of the interior with the help of the original interior panelsto make sure everything is just as how it was done back in 1952. The great thing about the Hirohata mercury is that the original Carson Top Shop headliner is still in the car, and still looking very good. 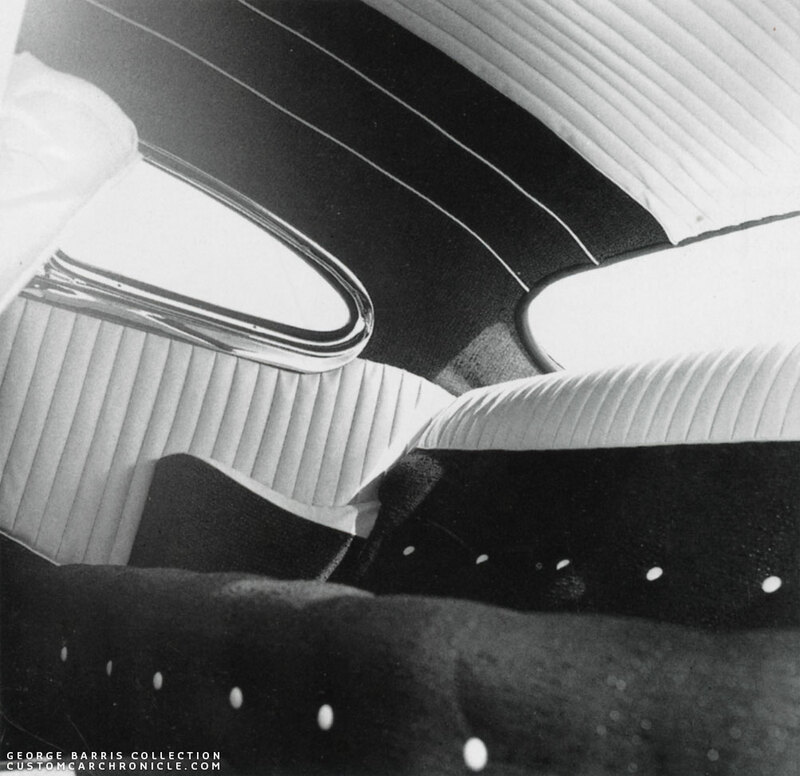 Louis Bettancourt in his Carson Top Shop upholstered ’49 Mercury. Glen Houser used off white naugahyde and wine colored fabric with gold metallic thread woven into it for a great glistering look. The fabric panels were button tufted with white buttons and finished with white piping. Notice that the foot protection carpets are off white and with the popular diamond pattern. The headliner in Louis car used the same material. The sides were done in the wine colored fabric with white piping and the center portion had lengthwise pleats. The whole look was very luxurious. With less tops needed to be done the old shop on Vermont Avenue in Los Angeles had become to big and the shop moved to 4717 South Crenshaw in 1954. The shop did continue to build the Padded Tops when they were requested, but by now the shop did not advertise the tops anymore. From the mid 1950’s they created several two part padded tops. The one they did for Bill Carr’s ’55 Chevy “the Aztec” was most likely the best known and most popular of this kind. The rear portion of the top looked very similar to an original padded top. But at the B-Pillars the top was split and usually a metal or chrome plated section was added. The front piece could very easily be removed and you could drive the car with an open top above the front eat, but still have the rear covered up. 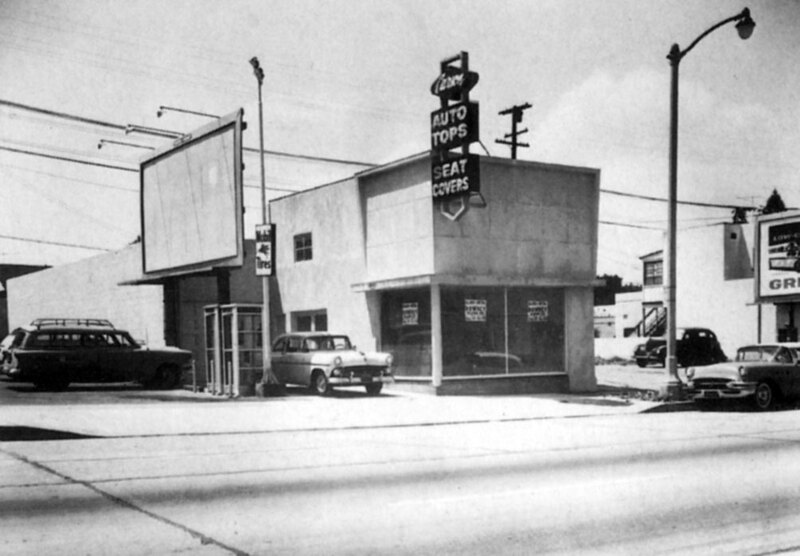 The Carson Top Shop on 4717 South Crenshaw Blvd., Los Angeles around 1955. 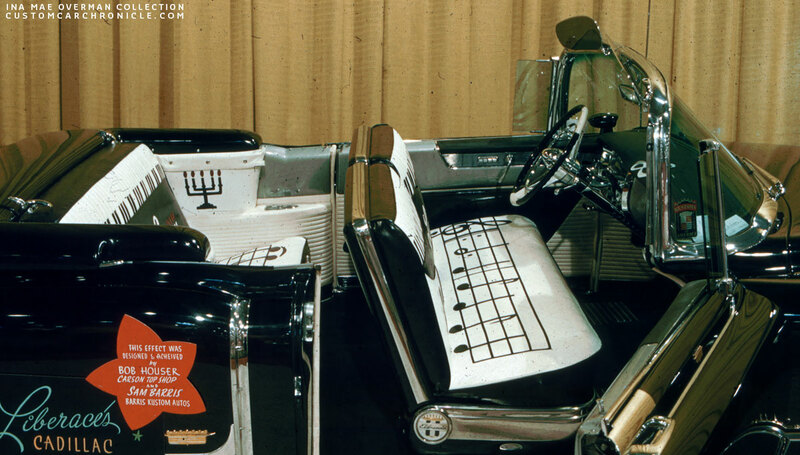 Liberace’s Cadillac had a full Custom interior designed by Bob Houser of the Carson Top Shop. Sam Barris also did some work on the car at the Barris Kustom Shop, but we cannot really call this one a Custom. The interior is also far from the full Custom interiors we are used to see from the Carson Top Shop. 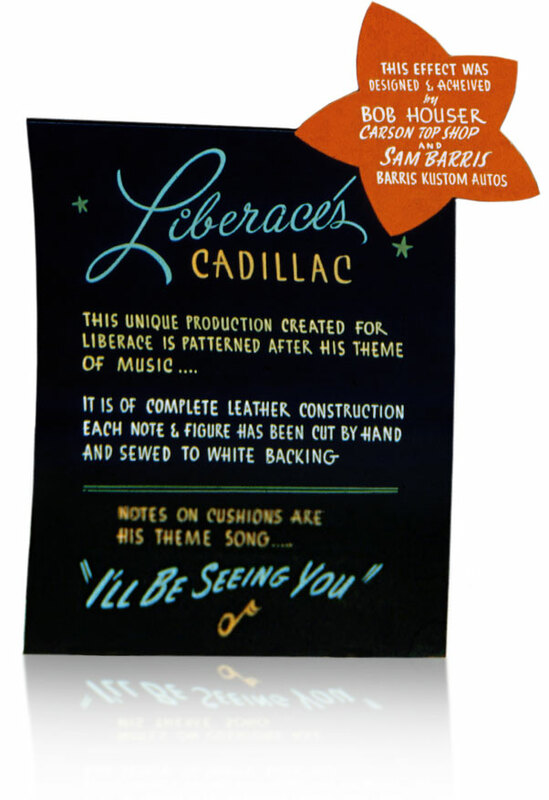 But the Music themed interior they created for Liberace was a big crowd pleaser, and it got the Carson shop a lot of ink. Which was well needed now the famous Padded Tops were not produced in the large numbers the shop was used. 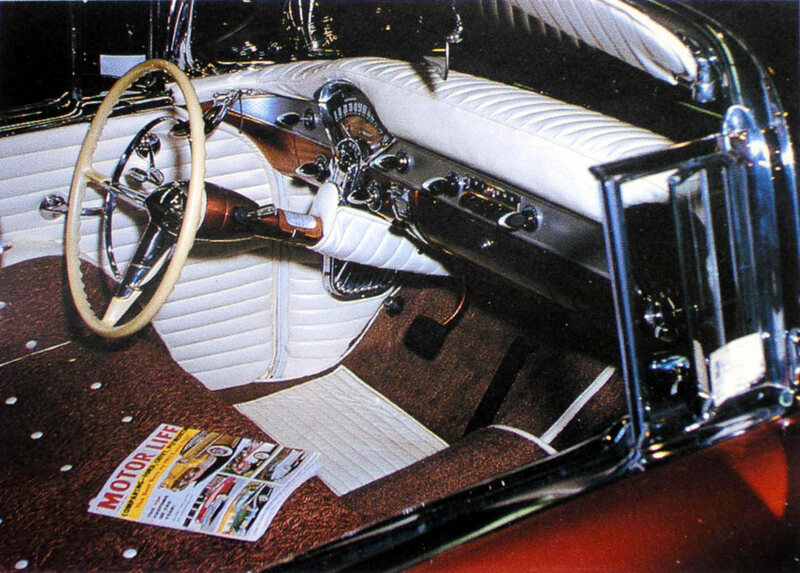 The Cadillac was barely customized, but the very unique interior, especially for that time made it a real crowd pleaser. The Carson Top Shop basically only created the new upholstery for the seats and some of the side panel details. 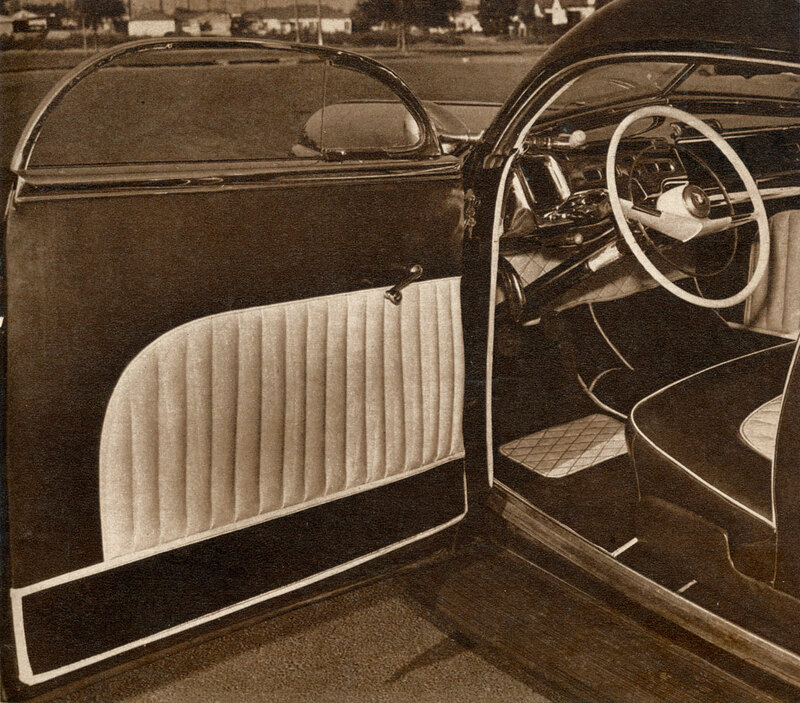 But the fine tuck&roll on the door side panels is Cadillac Factory upholstery. 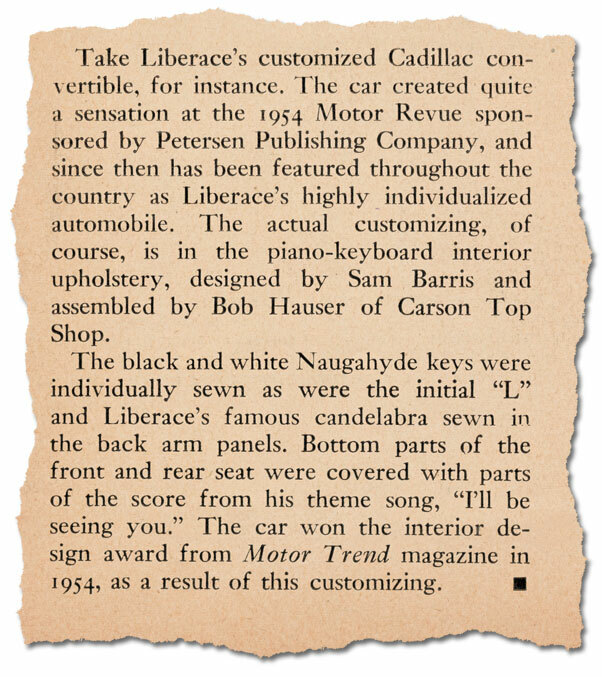 One of the many positive write ups about the Carson Top Shop created Music them interior in Liberace’s Cadillac. The Barris shop created a really unique Custom Car for Ed Sloan out of an 1953 Plymout. A very unusual car to start with, but as usual the Barris crew knew exactly what to do to make this one look very good. When the car was almost done and painted in a two tone green it was up to the Carson Top Shop to enhance the unique exterior of the car. The shop created a really wonderful interior using Green Mohair button tufted with lime colored tuck&roll Naugahyde. The green mohair was tufted with white buttons and outlines with white piping. On the headliner they also used a Brocade cloth to outline the Naugahyde tuck & roll sections. George Barris and Ed Sloan. 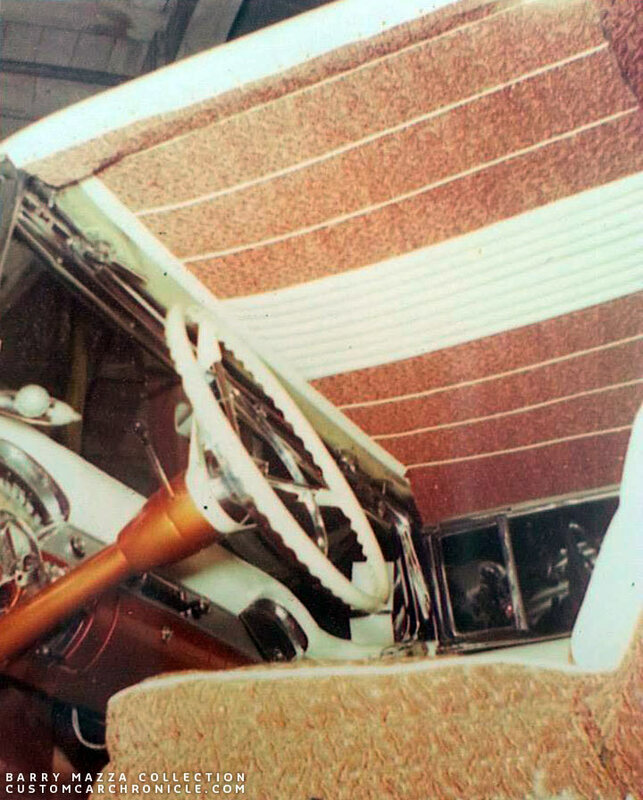 Photo taken at the Barris shop shows how the seat base was chrome plated, and how the seats and door panels were upholstered in button tufted green mohair and lime tuck&roll Naugahyde panels. Close up of the headliner shows how the tuck&roll sections are outlined with Brocade cloth piping, which cave the headliner a really unique look. The photo is faded, but it still shows that this car must have been really stunning inside and out. 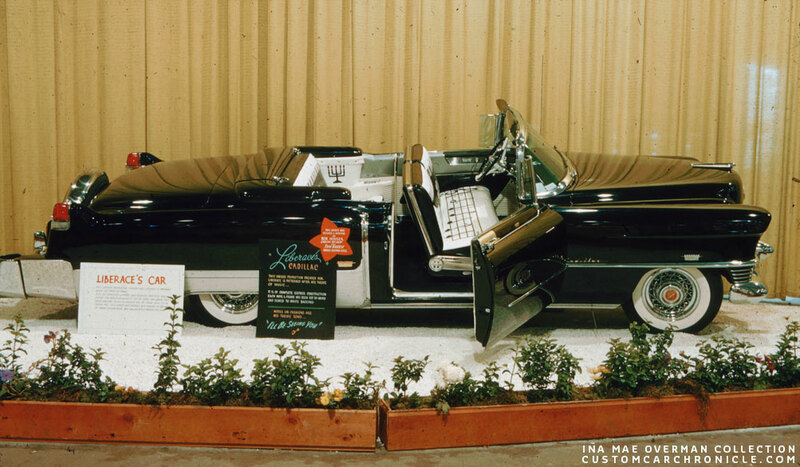 One of the most elaborate full custom interiors the Carson Top Shop ever created was for Jim Skonzakes 1953 Lincoln based Golden Sahara. 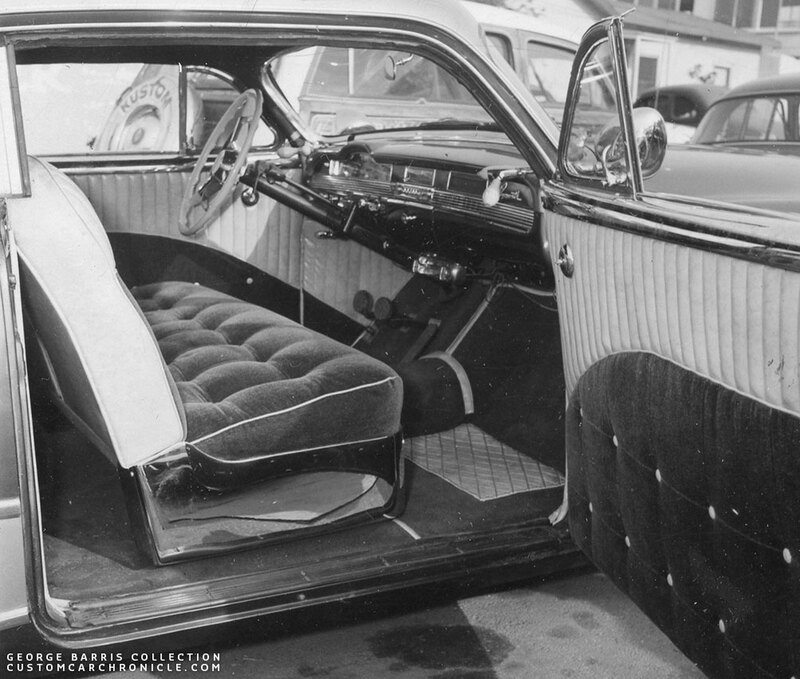 The car was created by the Barris Shop and when it came to the interior they teamed up with Carson to create a totally unique never before seen interior. The two shops joined efforts to create the totally home made dash, the rear wrap around seats and the cooling unit that also severed as mini bar.The Carson Top shop choice gold colored Boucle cloth white Naugahyde and off white carpets. The colors matched the white paint and coper plated details perfectly. The completed interior also include a TV, Tape Recorder, Radio, Telephone and Loudspeaker system. Birds-eye view shows the wrap around seats in the back with the mini bar cooler unit in the center of the rer seat. The front seat backs had special racks to store the glasses. Close up of the special glasses Jim used to display with the Golden Sahara. 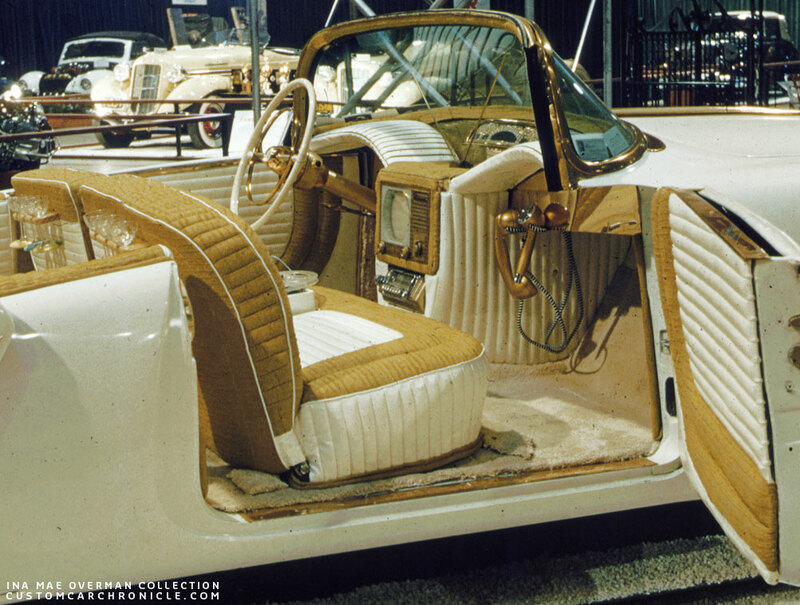 This great color slide shows really well how elaborate the Carson Top Shop work was on the Golden Sahara interior. Gold colored Boucle cloth white white Naugahyde. 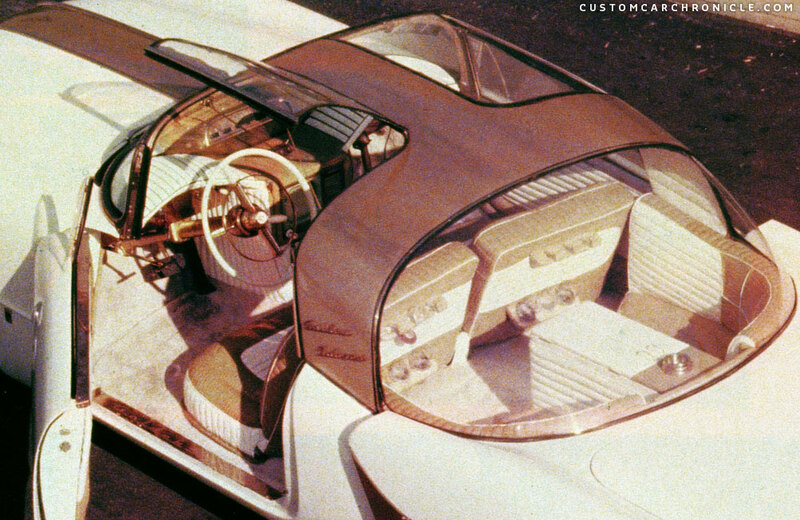 The Carson Top shop created the full interior and the two part padded top for Bill DeCarr’ ’55 Chevy named “The Aztec”. They used a really beautiful copper colored frieze material combined with white naugahyde. The copper frieze on the seats and door panels was button tufted with white buttons and the naugahyde was added with horizontal rolls. The top portion of the dash was padded and covered with tuck&roll. 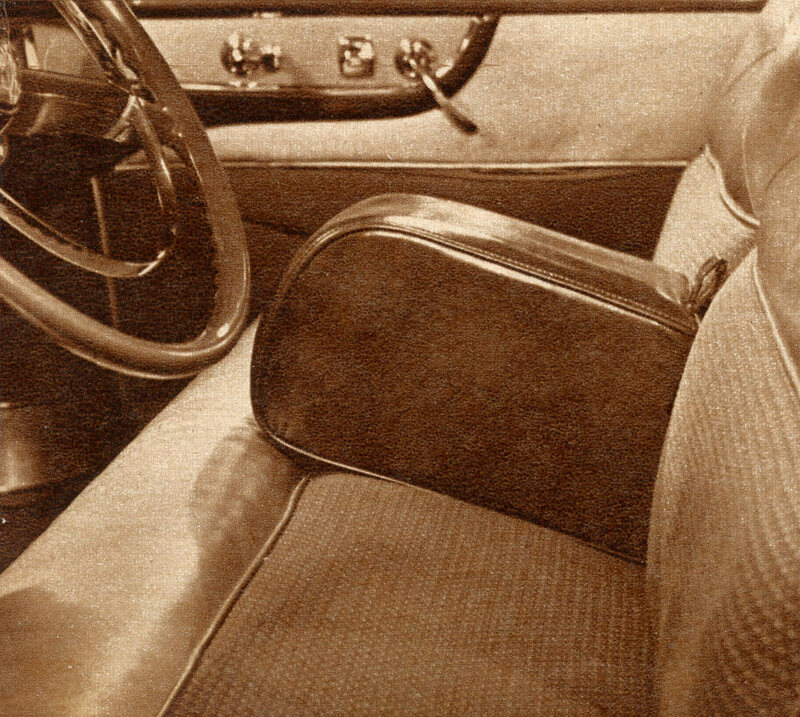 The top portion of the dash was padded and upholstered in white tuck&roll naugahyde. Even the sunvisors were fully upholstered with tuck& roll. Rare photo showing the beautiful upholstery on the inside of the two part padded top. Model Kipp De Mott shows that the interior is not just beautiful, but also very comfortable. The Aztec is still around today, completely restored by Barry Mazza and Bob Nitty. The interior was completely gone when they found the car, and they had a hard time to find photos showing all the details, and then finding the right material to recreate it as accurate as possible. 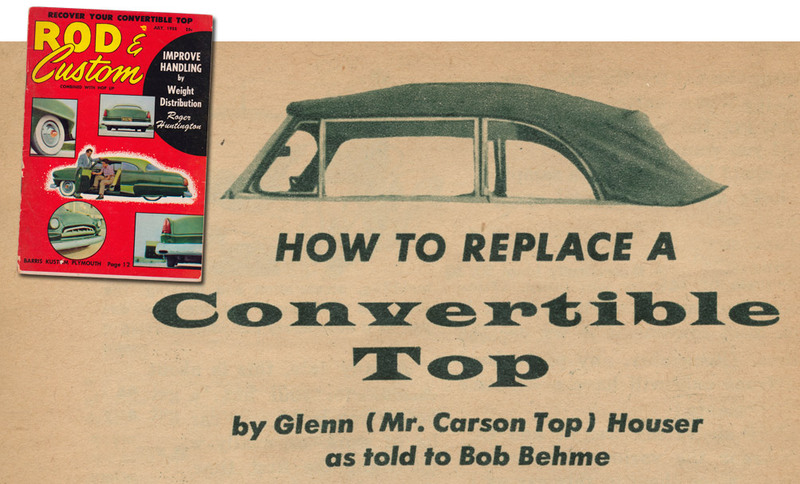 The July ’55 issue of Rod 7 Custom Magazine had a massive almost 7 page article on how to replace a convertible top told by Glenn Houser from the Carson Top Shop. It showed how you could replace a soft top by yourself. But of course Carson hoped the extra attention would draw new clients for this work to his shop, and it most likely did create some new business. In 1965 the last Carson Padded top was produced. For the Ford Custom Car Caravan several Ford cars were customized by the famous Custom Builders of the time. 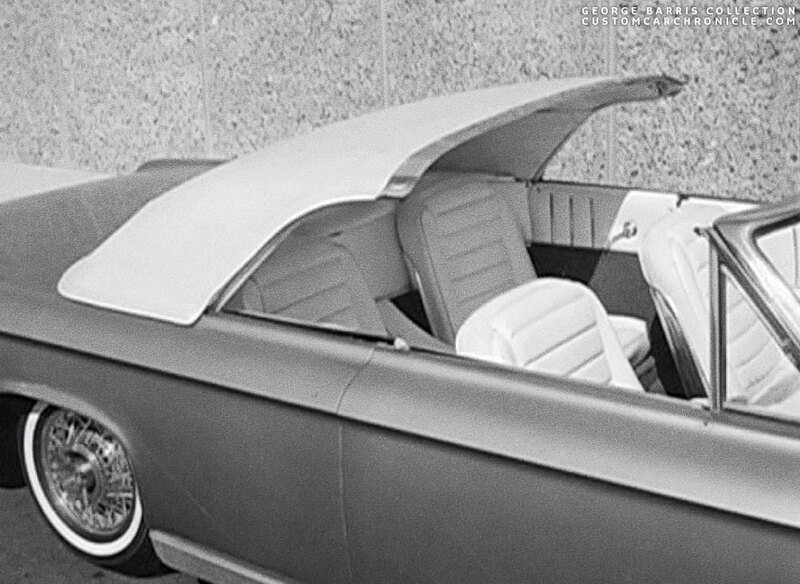 And for one of them, the Ford Galaxy, that Bill Cushenberry created on a 1963 Ford Galaxie Convertible, the Carson shop created a two part padded top. It would be the very last real Carson Top Shop padded top they created. There was no demand for such tops anymore, and the fine-grained white canvas that the shop used for the tops was no longer produced. 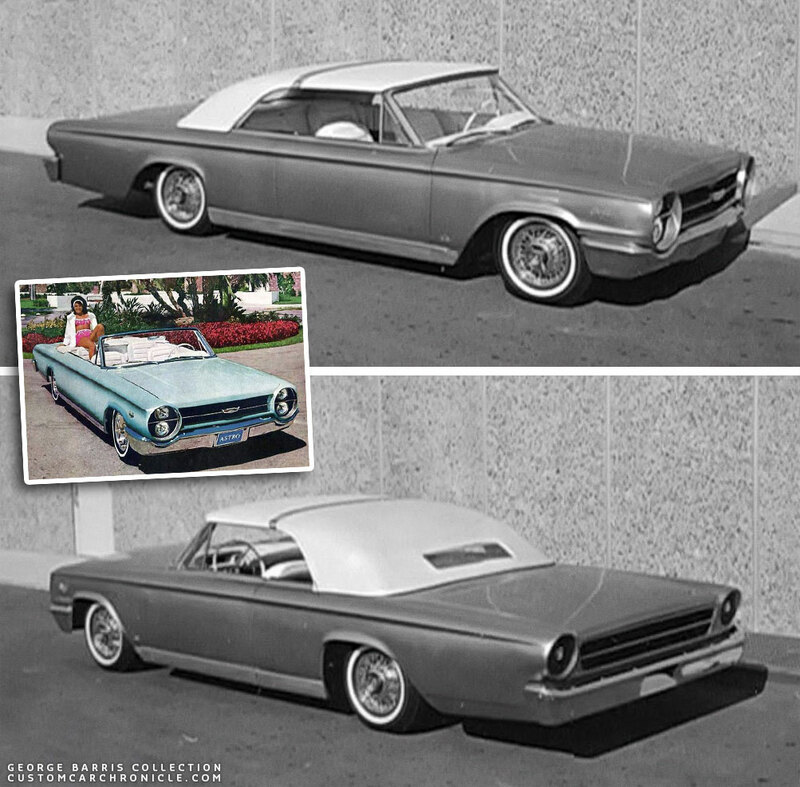 Bill Cushenberry created the 1963 Ford Galaxy “Astro” which would later get the very last Carson Padded Top. The last padded top the Carson Top Shop created was the two part top they created from the mid 1950’s and up. This photo shows the Ford with the front section removed. Around this time the shops main business was installing vinyl tops for local car dealers and individual customers. They still did some soft tops, interior work and Tonneau covers, but the hay-days were over. Glen Houser passed away in ’69 and left the business to his son Robert (Rob) Houser. In the early 1970’s Rob Houser was asked to restore an original Carson Top Shop Padded Top. Apperentley Rob was able to find some of the old canvas material and was able to create the top. But then one thing was still missing, the tag. None of the original tags could be found, the shop had not been using them for years, and if there had any left they were gone by now. The owner of the top really wanted to have and Carson Top Shop tag on the top, so they had some new tags created. The company who did them asked for a minimal order, which was quite a lot. After the restoration project was finished some of these extra tags where given to friends, other where sold. These ’70s tags still can be found from time to time. The recreated tags are a bit different from the original ones. small details in the size of the text. But the main difference is that the reproduction is silk screened on a metal plate, while the original was etched creating a relieved tag. 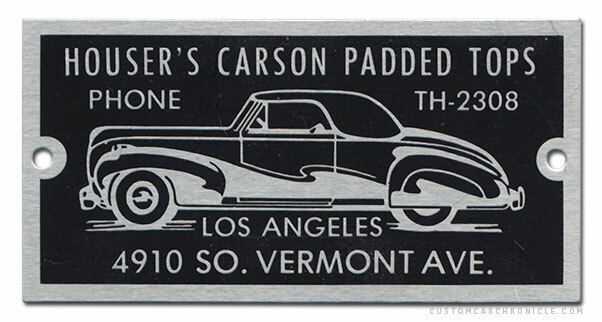 The 1970′ reproduced Carson Top Shop tag. The shop is now gone for several decades, but the Carson name and its influence in the Custom Car scene are far from gone. In the last couple of years we see a blooming interest in the recreation of traditional styled padded tops. Not just tops that look a bit like the original tops, not people study the old techniques, the old photos and recreate the tops with the same style, technique and if at all possible same material as in the 1950’s and ’50’s. 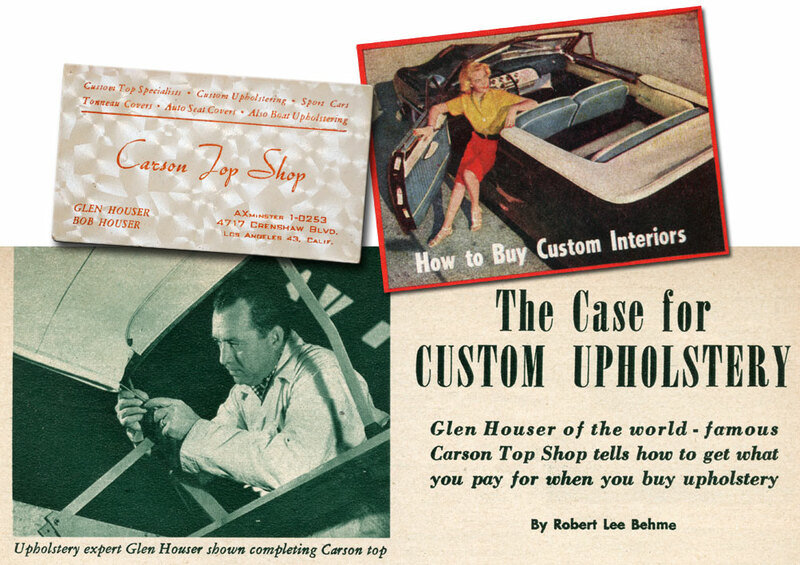 Motor Trend’s Robert L. Behme interviewed Glen Houser in early 1953 for his series of on-the-spot interviews of men in the custom car field. This story was published in the April 1953 issue of Motor Trend Magazine. SCENE: Carson Top Shop, Los Angeles, California. Bob Behme has just entered, and Glen leaves his workbench, wiping his hands on his coveralls, as he greets Bob. BOB: Glen, I’m here today, because MOTOR TREND is running a series of interviews with the men in the custom automobile field. 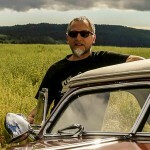 Along with Dale Runyan, you are one of the leaders in the custom top and upholstery, field. I’d like to ask you a few questions which I hope will give some of our readers enough information to know what to expect both in price and workmanship when they order custom upholstery. GLEN: That’s’ fine with me. Fire away. GLEN: That’s’ hardly the right way to ask the question, Bob. Ready-made seat covers fill a definite need, but they are like anything that is ready-made. They are made for a normal car – and no car is normal. Each seat is, different. Because of this, ready-made seat covers are bound to have a few discrepancies. Another thing – there are only a few fabrics to choose from, and there are only a few designs to buy. That is why guys like me are in business. We create something just a little more nearly perfect – something just a little different. We are not catering to the man who wants to save a few pennies. We can’t do that and stay in business. Instead, we are making upholstery and seat covers for the man who wants the best, and who wants something original. To illustrate the article several samples were used. This one shows the seat and kick paneld the Carson Tops Shop created for the Bob Hirohata Mercury. GLEN: These are a good many, Bob, but to name a few – Saran, Lederan, and Firestone’s Velon are all good. Fabrics for custom seat covers come in any color, and in many plaids and designs. They’d cost about $35 or $45 installed. 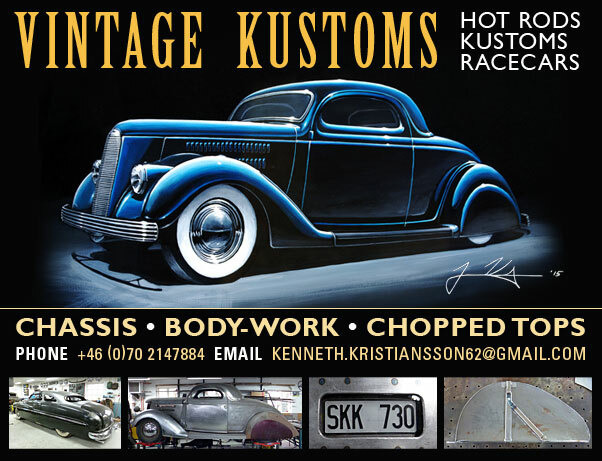 For Nick Matranga’s Barris Kustoms built ’40 Mercury they used maroon and off white with wonderful wide rolls and an unique pattern on the doors. The white piping around the seats and dark colored carpets make the interior really special. BOB: Okay. Let’s switch to a discussion of tops. Take that beat-up hard top of mine that’s lounging outside. Can that be covered with fabric? GLEN: The chrome moldings around the windows and doors are removed, and after the material is sewn together, it is stretched over the roof and tucked under these areas. Once it fits snugly, the molding is put back into place. This holds the top in place. On the earlier cars, the ’36, ’37, and ’38 models, there often is no such molding, and we must drill a few holes to fasten the fabric on with metal screws. 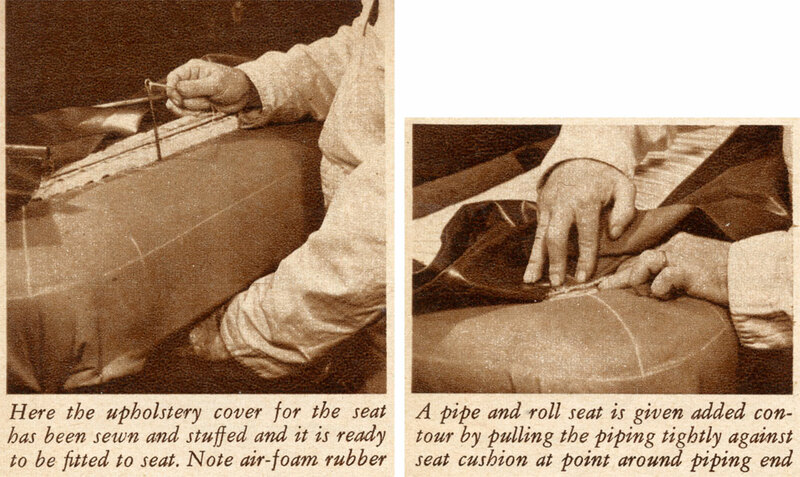 On a late car, the fabric could be removed without a mark, but with the earlier cars, the screw holes must be filled with lead if the top is ever removed. The cost for a fabric top would run between $125 and $175, depending upon the car. BOB: You just can’t talk about tops very long until the conversation naturally seems to drift to the Carson Top. They are now made for all cars, aren’t they? GLEN: Yes, they are. Carson Tops are now available for many of the foreign cars, including the Jaguar and the MG, – as well as for our own American-made automobiles. BOB: When you make a Carson Top you use all new parts, don’t you? BOB: Don’t such tops offer a choice of rear window designs? GLEN: That’s just the style I mean. It is known by many names -Riviera, Coupe de Ville, or wrap-around. The price of a Carson Top depends on the style of windows and the style of interior upholstery. A top with the open style windows and a plain interior starts at $200 for any car over a ’42 with the exception of the foreign cars. American autos older than ’42’s usually run about $175. ’36 and ’37 coupes are smaller and cost only $155. GLEN: No. It’s almost as easy to deal with as a folding top. You can install a hoist in the garage rafters and lift the top, or two people can easily pick it off the car and store it against the garage wall. BOB: Ah, there you’ve come up with a moot point! Just what is proper care? BOB: The folding top is not upholstered but both the hard tops and the Carson Tops have upholstered head linings don’t they? GLEN: Pipings are large tucks on the seats and side panels and head lining which are stuffed to give a series of half-circle rolls. Most- of the time, head linings are piped in a two-tone effect – say an all-over white fabric with a few rolls of green for accent. This is really a nice effect, but it seems to look best on customs. It doesn’t come off on a stock car. A stock looks best with either a single tone piping or the more sedate welting. 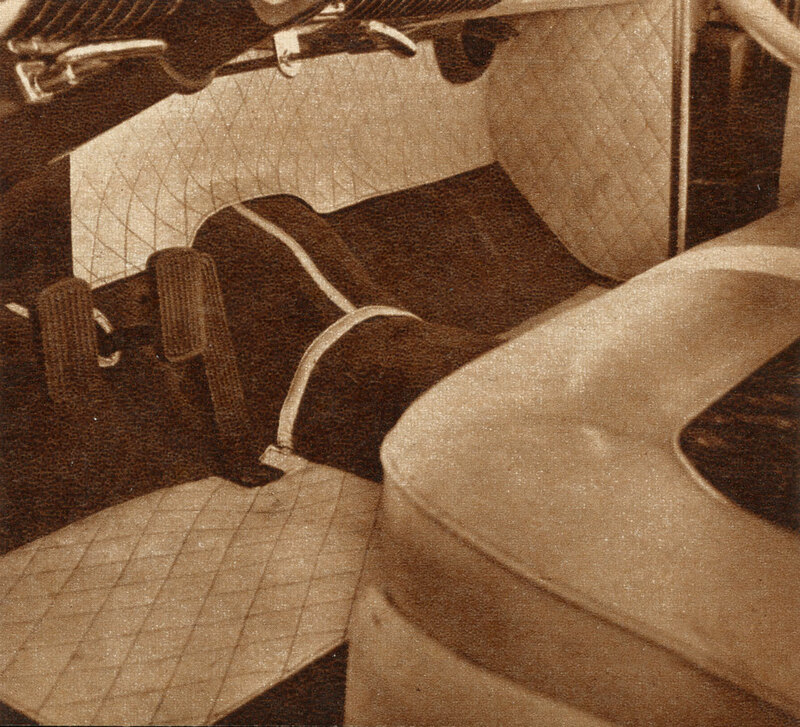 GLEN: At the moment – here in the West, anyway – the small two-inch pipe with a fairly large ‘horseshoe’ roll coming around the edges of the seats down to the floor is most popular. The small piping seems to look best and because it is tightly sewn, it seems to wear better than the larger piping. BOB: When upholstering the seats, you completely rebuild them, don’t you? GLEN: That’s right. We remove the upholstery and restyle it along the customer’s designs. The exterior is sewn on a bench, then, placed on the seat frame and padded to give roundness and softness. Prices should start about $250 if side panels and kick panels are included. GLEN: Sure, he could have the seats upholstered for about $175, but he wouldn’t really be saving money. Sooner or later he will want the door panels and the kick panels covered, and it will be another $90 to $100. If he has this done along with the seats, the upholsterer can cut all the material from one bolt with a greater saving in fabric and labor, and he can pass this saving along to the customer. GLEN: There is not as much demand for them as there was. It seems to be going out of style slowly, although we have recently done several ‘Kaiser’, type crash rolls. The upper half of the dash is padded with a heavy, soft ‘crash roll,’ while the lower area is chromed. This is quite striking. Some sports-type cars look good with a completely upholstered dash. A partial dash would cost about $35. Chroming shouldn’t run over $15 or $20. GLEN: No, but it’s a tricky thing to design. It should be limited to cars with a rather plain dash design. The late model Fords and Chevys take to it rather well. Most foreign cars look good. The toughest part of padding a foreign car is the work involved in removing and replacing the instruments. On either the American or foreign cars, it would run between $35 and $50. BOB: What do you mean by ‘plain’? The Custom removable arm rest the Carson Top Shop produced. This was one of the products you could order by mail in the color of your choice. BOB: At this point it seems natural to turn to tonneau covers. They are very adaptable, aren’t they? I wouldn’t consider them limited to smaller sports cars. GLEN: Tonneau covers improve the looks of almost any convertible. But more than that, they offer protection against the elements when the top is down. There are many variations of the tonneau cover. First, there is the ‘full’ tonneau. This fits from the back, the rear seat, up over the windshield and down, to snap around the sides. It protects the upholstery from the sun and moisture. The second design — perhaps the most popular — starts at the back seat and ends at the windshield. With the windows rolled up, it offers good protection from the dew, and with the exception of the open windshield, it is excellent protection from the sun’s rays. The third design is a half tonneau. It merely covers’ the rear seat. The full tonneau costs about $50. The second type, ending at the windshield, costs about $37, and the half-tonneau should cost about $27. BOB: This should sum up the upholstery interview pretty well, shouldn’t it, Glen? Got To PART ONE of the story on the Carson Top Shop. Nothing sets off a custom like a really nice custom interior. It is interesting t to see that other materials and types of patterns were used and not just the tried and true “Tuck and Roll.” I myself have always loved thew look and feel of Mohair. The other materials: thanks for opening up our vision to those other than Naugahyde upholstery materials that set off the custom interiors. On a cold Wyoming morning, jumping into a car with Naugahyde seats was like landing on a frozen board! I always liked the frieze with a gold or silver thread running through it. 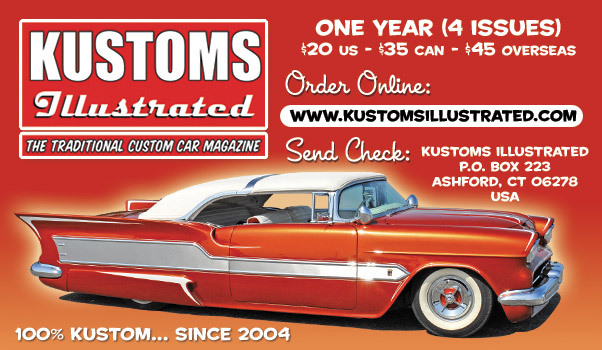 I recently purchased a ’40 Merc Conv with a 31/2″ chop top with a white plastic ’60’s top cover, not a Carson, and many custom items, ’41 Stude tail lamps nosed, decked, spinners, skirts etc. with a ruby red candy paint. It has a Housers Carson plate on the front top bow. I think it is a silk screen version. The person who sold it to me had ti since 1974. Does anyone know more about this car?